Workers at nuclear power plants in Georgia provide a vital service to residents of the state, but they risk injury or death on the job. This is especially true when the plant is going through an expansion similar to the expansion at the Alan M. Vogtle Electric Generating Plant—also known as Plant Vogtle—near Waynesboro. This plant is in the process of constructing two new reactors, which means more workers, congested traffic, and opportunities for workplace accidents. If you work at Plant Vogtle and were hurt in an accident, you may be entitled to workers’ compensation benefits under Georgia law. When a nuclear power plant employee must work on a scaffolding, catwalk, or ladder, he can suffer devastating injuries in a fall—traumatic brain injury, back and spinal injuries, paralysis, and internal organ damage are common. This is especially true if he was not provided with a fall protection system or was not required to use it on a regular basis. If wiring is faulty, machinery has not been tagged out, or workers are working too close to electrical lines, they can touch a live electrical wire. This can cause electrocution, serious electrical burns, or death. Employees in nuclear power plants work around many toxic substances that can cause a fire or an explosion if not stored properly. Workers can also be burned if they are blasted by hot steam, which is a common danger at nuclear power plants. If the plant worker’s job involves working with or near heavy machinery, he could become caught between the machinery or have it fall on top of him. In addition, sometimes clothing can become caught in the machine’s moving parts—causing amputation of a body part or the worker’s death. Workers in power plants often must lift heavy objects, work in confined areas, and perform repetitive movements. This can cause them to suffer overexertion or repetitive motion injuries to their backs, necks, shoulders, and knees, resulting in chronic pain and limitations in their day-to-day activities. When power plant employees must work around trucks, they can be injured in a vehicle accident on site. Forklifts can cause catastrophic injuries if they tip over or if a truck pulls off the dock before the forklift has finished loading materials onto it. Many tragic accidents are caused when people operating vehicles or heavy machinery do not see nearby workers and crash into them. 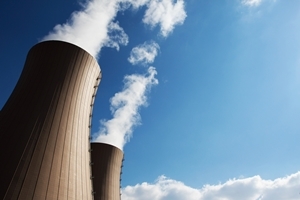 Nuclear power plants can become extremely noisy. Workers can suffer permanent hearing loss from being exposed to excessive noise, especially if they are not provided with safety equipment to prevent such injuries. Did you suffer a workplace injury at Plant Vogtle or the Hatch plant in Georgia? Christopher Hudson is here to answer your questions and help you fight to obtain the workers’ compensation benefits you deserve. Order our free book, Understanding Georgia Workers’ Compensation, and then contact us online or call our office directly at 703.863.6600 today to schedule a free, no-obligation consultation.